George Graham Reviews Lizz Wright's "Dreaming Wide Awake"
The pop music business is more or less by definition fad-driven. According to popular wisdom, the way to keep selling music is to give people supposedly new styles, and when one catches on, flood the market with sound-alikes. Thanks to the success of Norah Jones, we are certainly seeing a lot of recordings by chanteuse style vocalists, women with a somewhat romantic and perhaps jazzy bent. And unlike most fads, this one is resulting in a surprising number of worthwhile recordings by women whose music might never have seen commercial release, say four or five years ago. So far this year on this series, we have featured worthy albums by Sylvie Lewis, Judith Owen, Grazyna Aguscik, and Sarah Fimm. And this week we have yet another from an artist who changed her style somewhat on her new CD, Lizz Wright. Her new sophomore release is called Dreaming Wide Awake. Lizz Wright grew up in Georgia, the daughter of a preacher and a church organist. She toured with her parents, singing in their choir, and came to more widespread attention in 2002 performing in a series of Billie Holiday tribute shows. She started to attract national press coverage from those performances, and in 2003 released her debut CD Sand which found her in a jazzy, or perhaps smooth-jazz mode. She also appeared on a track on jazz saxophonist David Sanborn's 2004 CD Closer, in a rather commercial pop sound. But for her new CD, she changed direction. One day in Atlanta, when riding in a cab, she heard a Sarah McLachlan song and decided that was what she wanted to do, so she turned to the guitar, after the piano had been her main instrument for songwriting. She also chose to take up some songs from a variety of non-jazz backgrounds and revisit them in an acoustic-guitar dominated mode, but with her jazzy singing style intact. Dreaming Wide Awake turns out to be a wonderful recording, really setting her apart from the current school of chanteuse-style singers. The recording recalls Cassandra Wilson's memorable 2002 release Belly of the Sun, which also featured guitar-dominated but very creatively altered versions of songs from the rock and pop world. Lizz Wright's recording features a mix of material from such sources as Neil Young, the Youngbloods, children's performer Ella Jenkins, a tune covered by the Beatles, one from Tin Pan Alley, plus a couple of originals and ones written for this CD by composers like Jesse Harris, who wrote some of Norah Jones' hits. Ms. Wright's warm, rich vocals come into focus much better in the setting on this CD, and she takes advantage of the acoustic instrumentation which better shows off the subtleties in her performance. She is joined by a sympathetic band which includes guitarist Chris Bruce, jazz bassist David Piltch, drummer Earl Harvin, and keyboard an Glenn Patscha, of the band Ollabelle. Notable guests include texturtal electric guitar maven Bill Frisell, and multiple guitar and steel player Greg Leisz. The CD's producer was Craig Street who encouraged the imaginative eclecticism. There is no shortage of album releases by jazzy, ballad and torch-singing chanteuses these days. A surprising number in the current crop have been worthwhile, and some strikingly memorable. 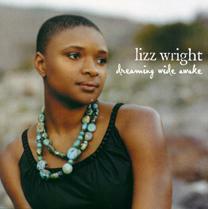 Lizz Wright's new CD Dreaming Wide Awake is one of the latter. She is a superb vocalist, and imaginative interpreter of songs from a wide range of sources, something that was not so apparent on her previous recording. The acoustic-guitar-dominated setting proves to be a great match for Ms. Wright's vocals which can at once be sultry and hinting at Gospel influence. Our grade for sound quality is an A-minus. The acoustic instruments are well-captured and there is often a wonderfully atmospheric sound that fits well with the arrangements, but some tracks have some unnecessary effects on Ms. Wright's vocals. Some also have a noticeably compressed sound, even though overall the CD has a decent dynamic range by contemporary standards. Lizz Wright's Dreaming Wide Awake is a worthy addition to the rapidly expanding catalogue of chanteuse recordings, and is also one of the most interesting and creative of the year.